February 2, 2018 — I have this loosely held idea that language constantly evolves because it's trying to find the perfect phrase. Once it does, I assume the language then dies, having fulfilled its purpose. “Girl in a glass coffin” isn’t it for the English language, but it might be the closest we've gotten so far. And in turn-of-the-century Oswego, a pleasant town right on the shores of Lake Ontario, the phrase was more than just an evocative one. In October of 1899, the 11-year-old daughter of one of the wealthiest families in the area died suddenly of appendicitis. Her name was Virginia Tonkin, and her parents placed her body in a hermetically sealed, glass-topped coffin. They held the viewing in the library of the house, and then afterward moved the fairy tale coffin into her old bedroom, ostensibly until that they could build a family mausoleum in a nearby cemetery. 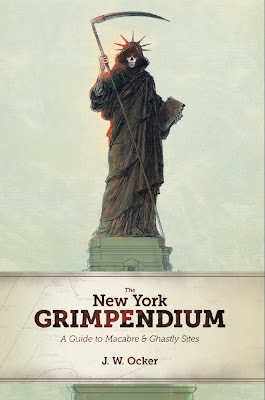 However, as time went by, it became increasingly apparent, much to the morbid delight of both the newspapers and the town gossips, that the Tonkins weren’t planning on interring Virginia any time soon. The death of a child will excuse most types of behaviors, but there is a line. And I’m pretty sure it’s drawn somewhere before months of nightly vigils over the decaying remains of the loved one. Naturally, it became a tabloid story, and all kinds of untruths, half-truths, and truths were spread. After all, who can resist the tale of powerful millionaires powerless in the face of death and distraught to the point of bucking both propriety and innate human reactions of revulsion. I certainly can’t, and, in fact, find it difficult to not invent ghastly practices just to make the story even more macabre. I mean, I can imagine the family using her casket as a dinner table, throwing tea parties for her with everybody in the house expected to attend, and introducing her to possible suitors. In reality, though, all the family ever admitting to was changing the flowers on her coffin and praying daily at Virginia’s side. Eventually, the authorities intervened, although for a while they weren’t sure that they could since there were no actual rules on the books at that time for this particular situation. 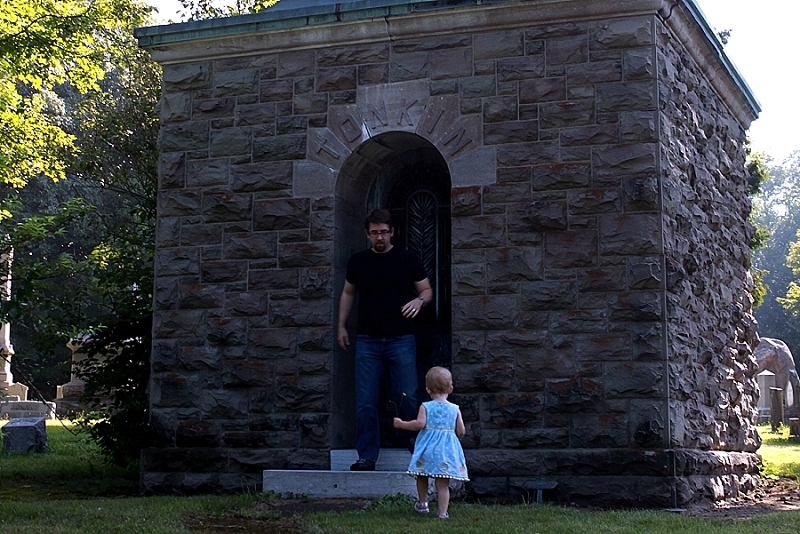 After putting up a fight, the Tonkins reluctantly complied and, about a year after her death, placed their daughter in the new family mausoleum. Unfortunately, their newfound notoriety placed a further burden on the family. Not only had they lost one of their four children twice, once to death and once to a cemetery, their youngest daughter Rosamond started receiving death threats from some anonymous deranger who would send drawings of the daughter, the interior of the family house, and various situations involving her kidnapping. The artist would demand ransoms, but would never instruct them as to how to deliver the money. The mutilation and murder of a local child named Cora Sweet intensified the situation for the Tonkins, who then hired armed guards, tried to go into hiding at different times, and sheltered Rosamond in what basically amounted to a glass coffin. Remarkably, this horrible situation actually went on for a few years, and, strangely enough, probably made a lot of people feel bad for intervening and forcing the Tonkins to stop fetishizing their other daughter’s corpse. The letters eventually ceased, and Rosamond grew up and married and was able to compartmentalize that relatively short section of her life over the long run. Nobody ever discovered the identity of the demented artist. Today, the impressive Tonkin Mansion still stands at the northwest corner of West Seneca and West 5th Streets in the Franklin historic district, although it’s a bit spookier these days. 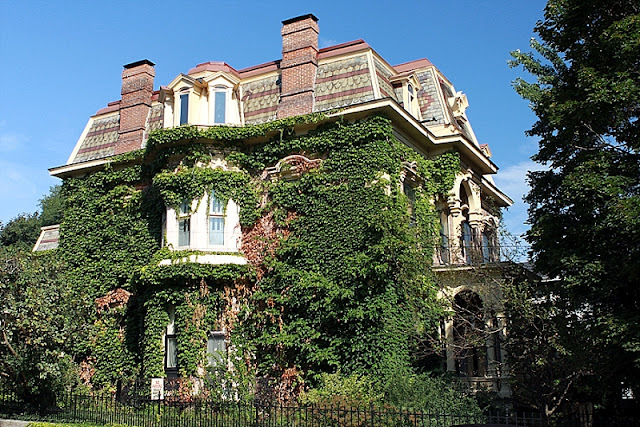 The enormous house is currently divided into apartments and is overgrown with creepers to the point that it looks like an ideal place for storing the cadavers of children. The mansion is officially known as the Perez House, after the builder of the place, but to those who like their history a bit more eerie, it’s still called the Tonkin Mansion. You can also pay your respects to Virginia herself. The Tonkin mausoleum is located in Riverside Cemetery at 4024 County Route 57. It’s located at the back, more secluded area of this decent-sized cemetery. 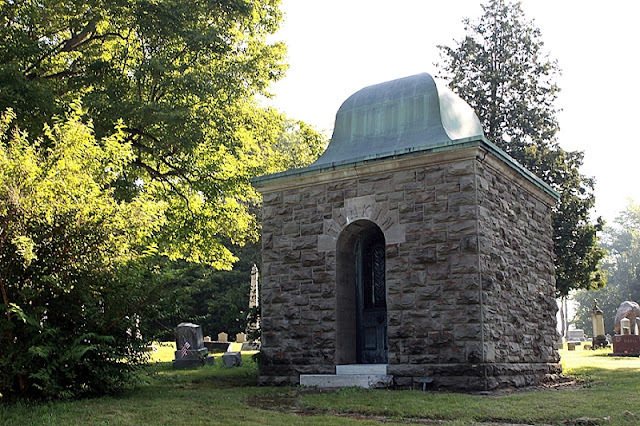 The standalone mausoleum is made of heavy gray stone with a green bell-shaped roof. The surname of the family is proclaimed above the portal, and a lion’s head beneath a palm frond decorates the metal door. That door is more of an ornamental grate, though, so you can look through into the small area inside, and see the stone drawers, a couple of which have nameplates, including Virginia’s. 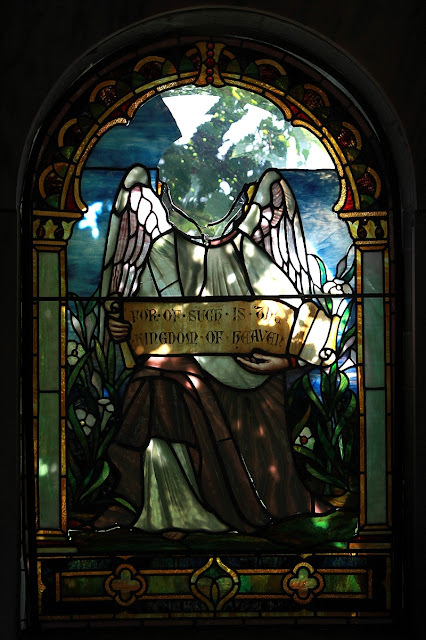 The small interior is lighted through a stained-glass window in the back that depicts a kneeling angel holding a scroll with the words, “For of Such is the Kingdom of Heaven.” The window was damaged when we visited it, the glass breaking in such a way that it completely decapitated the angel, making ironic the aforementioned caption. 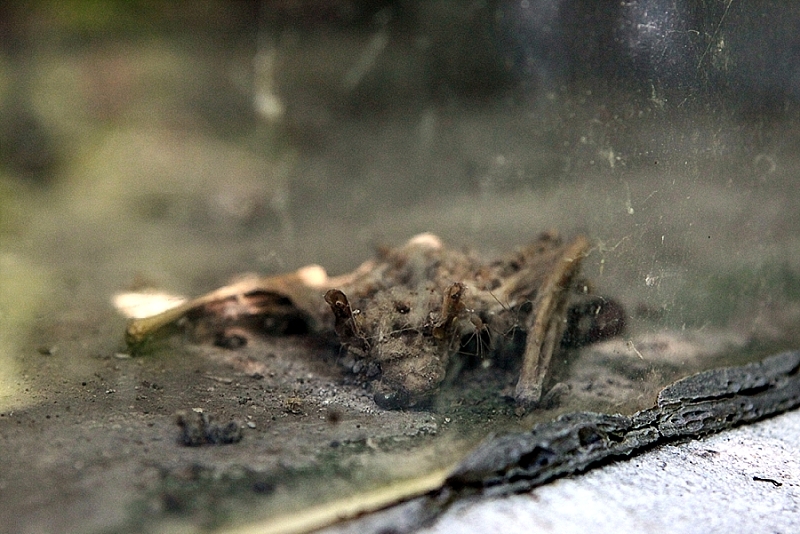 The coda to this story is that we circled to the back of the square mausoleum, which was overgrown with grape vines and other plants, and saw a small desiccated bat on the interior window sill. It must have gotten trapped at some point between the stained glass (entering probably through the hole above the angel’s neck stump) and the protective plexiglass that had been placed on the outside of the window. There it died and was preserved, protected from the elements and all the death-feeders. 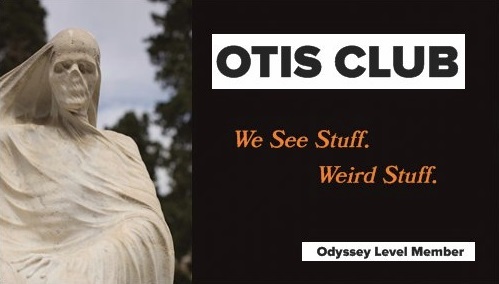 But “bat in a glass coffin” just doesn’t have the same ring to it.